Stanley R. "Swede" Larsen was a lieutenant general of the U.S. Army, who commanded II Field Force of the Military Assistance Command, Vietnam, a corps-sized unit in the Central Highlands, during the buildup of U.S. ground forces in the Vietnam War. He later commanded the Sixth United States Army in the Presidio of San Francisco. He arrived in Vietnam on on August 1, 1965, and took command of Task Force Alpha, an imterim headquarters forces in the areas of the Army of the Republic of Vietnam (ARVN) II and III Corps. 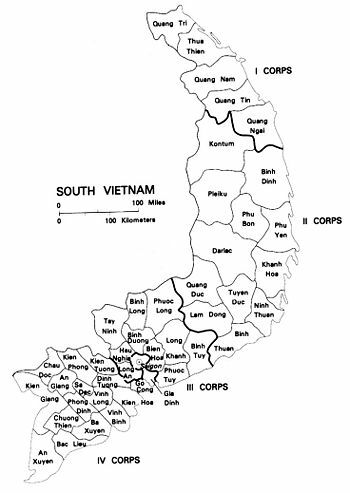 The ARVN called its geographic commands "corps" or "corps tactical zone," or sometimes "military region", the usual U.S. designation of a large tactical command as a corps would be ambiguous. Subsequently, he took command of I Field Force, which operated in the ARVN II Corps tactical zone in Central Vietnam. After the Lyndon B. Johnson presidential victory and the buildup of U.S. ground forces in South Vietnam, it was necessary to have intermediate tactical headquarters below the level of Military Assistance Command, Vietnam (MACV). To avoid confusion, U.S. corps were called "Field Forces". In South Vietnam, Larsen commanded, from March 1966 to July 1967, what was called I Field Force. It was activated in January 1966, and was considered to have have the lineage of the XXII Corps, which fought in the Second World War, European Theater. I Field Force was headquartered at Nha Trang, and had the 53rd Signal Battalion supporting its connectivity to its forward command post; the Corps Area Communications System under MACV managed its higher-level communications. This complexity came because its operating area covered 46% pfthe land area of South Vietnam, including the mountains of the Central Highlands. Larsen's II Field Force controlled 1 Cavalry Division (airmobile), the first air assault division, during the Battle of the Ia Drang and Battle of Bong Son. During the Ia Drang campaign, Larsen investigated a possible cover-up of casualties at LZ Albany, and offered to court-martial several senior officers for lying. GEN William Westmoreland, commanding MACV, according to an affidavit given to Joe Galloway, a journalist highly respected for his actions and reporting in combat, told Westmoreland to "let it slide". He reported on August on the two years of progress in II Corps, from August 1965 to July 1967, in a memorandum to the Deputy Secretary of Defense. In that period, he said the population had changed from "nearly half" Viet Cong control to 89% under South Vietnamese control. 90% of the roads were open, including Highway 19 from Pleiku to Qui Nhon. 53% of the railroads, essentially inoperative in 1965, had gone into service. He spoke highly of the ARVN 22nd Division, which worked closely with the 1st Cavalry Division (Airmobile), and the South Korean divisions. Rural development was on a positive note. This page was last modified 06:39, 13 August 2010.